SAP ABAP - Hashed Internal Table (Table's Key Access) With Example. Now the table SKB1 has a primary key which is a combination of BUKRS (Company Code) & SAKNR (G/L Account Number). 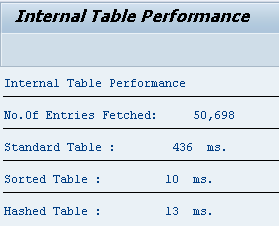 When we make a hashed table with key same as the table key, the performance improves drastically as shown. 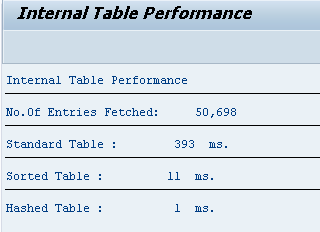 Tip: You can sort hashed internal table but never sort it because it will affect the performance badly. SORT ha_skb1 BY bukrs saknr.